Published on January 11, 2015 by Rachelle J. 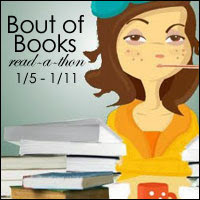 For Bout of Books 12 information, visit the Bout of Books blog. finish off the books I’m currently reading. – I’ve finished the books I was reading before Bout of Books 12 started. Read at least one new book off of my TBR shelf. Onyx Webb and The Kingdom Lights were books on my TBR. Finish at least 3 books. – Done, done, and done! The Kingdom Lights by Steven V.S. 186. I finished The Kingdom Lights, and started Walking the Labyrinth by Lisa Goldstein. It’s my last review book for January, and it feels so good to be ahead of schedule again! I’m not likely to finish it by the end of today, since I’ve got errands to run and laundry to finish, but I’ll have it read long before the end of the month. I didn’t participate in the mini-challenge yesterday. Congrats on meeting all of your goals! I’ll definitely have to check out Onyx Webb – I can’t say no to a free book. 🙂 Did you like it? Congrats on meeting your goals and getting ahead of schedule! That’s always a great feeling.